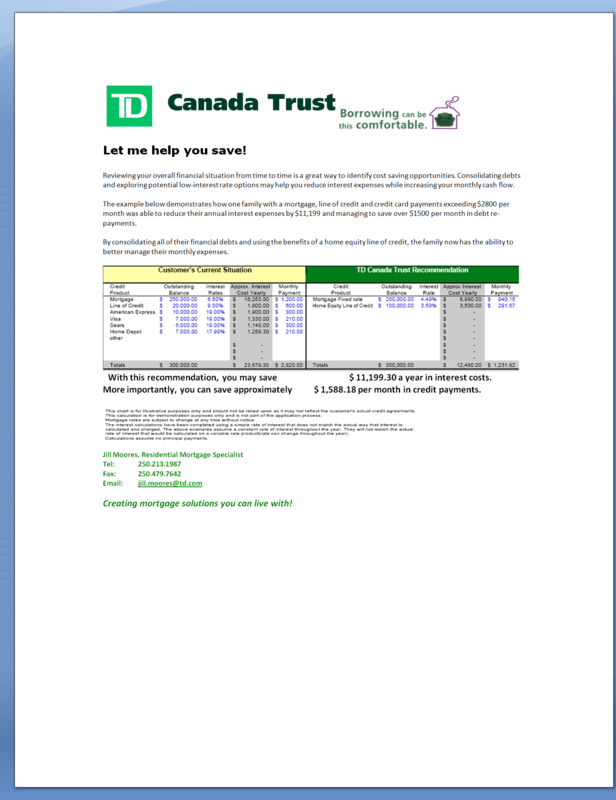 Your TD Canada Trust Mobile Mortgage Specialist in Victoria, BC. Let us help you find out what you can afford! Our mortgage calculator will help you determine loan amounts, mortgage qualification, or whether you should be renting or buying a home in Victoria. Let me help you save! Reviewing your overall financial situation from time to time is a great way to identify cost saving opportunities. Consolidating debts and exploring potential low-interest rate options may help you reduce interest expenses while increasing your monthly cash flow. The example below demonstrates how one family with a mortgage, line of credit and credit card payments exceeding $2800 per month was able to reduce their annual interest expenses by $11,199 and managing to save over $1500 per month in debt re-payments. By consolidating all of their financial debts and using the benefits of a home equity line of credit, the family now has the ability to better manage their monthly expenses. With this recommendation, you may save $ 11,199.30 a year in interest costs. More importantly, you can save approximately $ 1,588.18 per month in credit payments. Why get pre-approved for a home mortgage? Mortgage pre-approval should be your first step when you’re seriously looking to Buy a home in Victoria B.C. In order to make an informed and confident decision, you need accurate and timely information. My aim is always to provide the tools and reference information, so you have a clear picture of the mortgage and home purchasing process. Keep in mind, it is vital to review your personal financial situation with a professional Mortgage Specialist who can put in plain words the best way to approach your mortgage needs. You will know your monthly payment amounts, as well as the size of the down payment required. Realtors will likely request a pre-approval prior to showing you any homes. You will be able to stay within budget and not be steered off track. Your real estate agent will show homes you can afford – saving time and hassle. When you make an offer to purchase, your realtor will present the offer and indicate to the seller that you have solid financial backing. The seller knows you are serious, putting you in a stronger negotiating position compared to another buyer without a pre-approval. 90-120 days Rate Holds – A pre-approval will “lock” you into an interest rate, protecting you from any increases for the next 90-120 days. If rates go down, I’ll secure the lower rate, but if rates go up the lower rate holds as long as funding occurs within the 120 days. Mortgage Pre-approvals are for your benefit with no cost to you. Also you are not obligated to accept the pre-approved mortgage if you should change your mind. What takes place during the Pre-Approval Process? As your Victoria TD Mortgage Specialist I will take your information in the form of an application. You will provide financial and employment details such as proof of income, assets & liabilities, down payment, etc. By signing the application form you are giving authorization to release and review information on your credit bureau file. As your Victoria Mortgage Specialist I will discuss your financial strategy and mortgage details. I will provide personalized mortgage handouts allowing you to easily review the details later. In our meeting, you will learn about the various mortgage products and options available (fixed vs. variable rate, open or closed, interest terms, payment options, amortization, etc.) We will determine which of these options best suit your current financial situation. I will advise you what fundamental documentation is required for your approval. Documentation is ideally provided early to help the process go smoothly and complete on time. Note: All conditions must be met in order for your mortgage to be fully approved. For your Mortgage Pre-Approval or more information please contact Jill Moores TD Mortgage Specialist. Providing mortgage solutions you can live with! 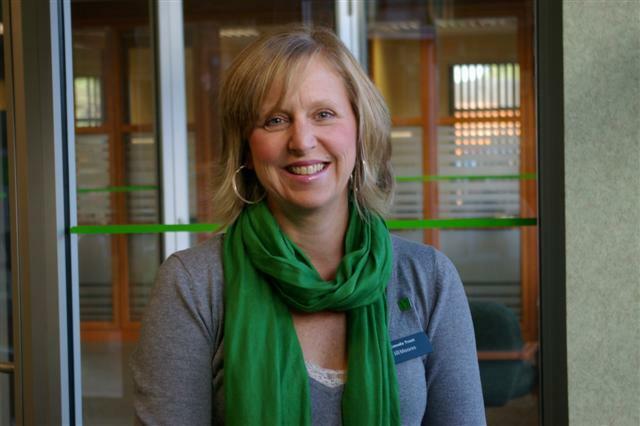 By Jill Moores Victoria BC TD Mobile Mortgage Specialist. Don’t wait until rates go up to do something, act now!! Yes, you can still purchase a Home in Victoria with 0% down payment. Yes, you can still qualify using the fully discounted 5 year fixed rate product. Yes, you can add upgrades to your purchase (purchase with improvements). Yes, we can use up to 100% of the suite rental income to qualify depending on the situation. Yes, we can provide Bridge financing if purchasing another home and you have a mismatch on the possession dates. Yes, we can provide interim financing if you want to complete a new purchase prior to selling your existing residence (subject to qualification). Yes, you can purchase a ‘leaky’ condo under an approved remediation program. Yes, we can now finance mobile and float homes. Yes, we can shop the market for competitive products and rates through our brokerage affiliate. No need to go to a broker. Yes, you can deal with a real live person (me) and real bank instead of a ‘virtual bank’ and a 1-800 number. Rate is not everything. Yes, you can use up to $25,000.00 from your RSP for the down payment. Yes, we can provide long term rate holds if purchasing in a project completing within the next 24 months. Yes, you need to speak to a Victoria BC TD Canada Trust mortgage Specialist expert. Please take advantage of my expertise and obtain the best advice for your Victoria Home Buying or mortgage refinancing. Don't You Want to Know if You Can Afford Your Own Home? Many people who rent can actually afford to buy their own home. So what's stopping them? Many tenants believe that they require a big down payment which is difficult, if not impossible to save, while trying to keep up with payments on all their other bills. Others are convinced that they will not qualify for a mortgage and that the payment would be just too difficult to carry. Just about everybody is overwhelmed over the legal and financial details which often surround the purchase of a first home. It seems a whole lot easier to just keep paying rent. But, is this the best option for you? · Many people actually qualify for a 5% down payment mortgage and don't realize it. · The average mortgage payment costs about the same as the average monthly rent payment. · Many renters have funds in RRSP's that can be used as part of a down payment without paying income tax on the withdrawal. 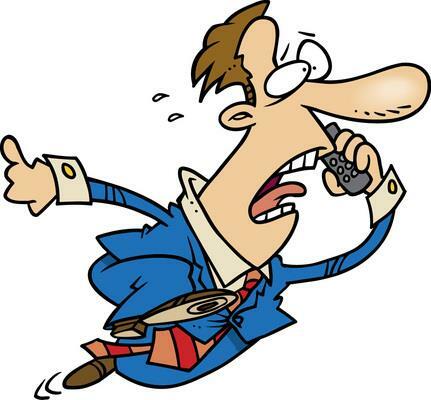 · A lot of people don't want to ask a salesperson anything because they are afraid of feeling obligated to buy something. · I will consult with you on an individual basis to help you determine what you can afford. · I will explain the whole process and answer any questions that you have until you feel you are ready to take the next step. · Most importantly, if at anytime you choose not to proceed, just tell me. There is never any pressure to continue. I know that buying a home can be stressful. It is my job to make it as easy and comfortable for YOU as possible! Call me today at 250-213-1987 to set up an appointment.